I participated that month and loved the block. Your setting really shows them to great advantage! This is wonderful. I love everything about it. Lovely! I’ve been a winner once and it’s great fun! Wow – just love all the bright colours. FYI, I updated your post to put it in the show and tell category so it will appear in the Gallery and be featured on the Home page. 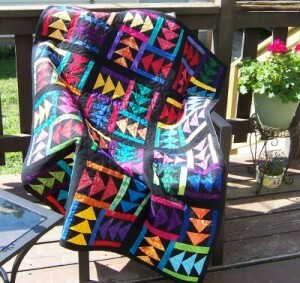 I’ve loved that pattern and wanted to do a quilt in it for a long time!